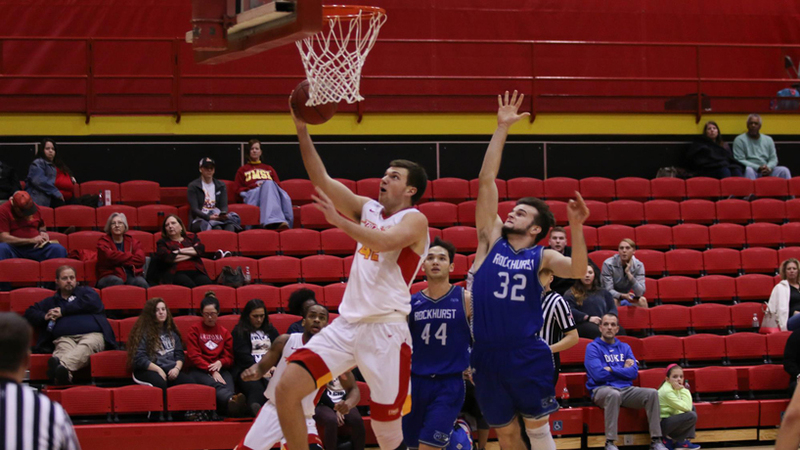 UMSL senior Eric Dust averaged 13.5 points and 8.0 rebounds over two games as the Tritons opened their 2018-19 regular season with wins over Walsh and Tiffin at the GLVC/GMAC Challenge. UMSL opened the season with two wins at the GLVC/GMAC Challenge, hosted by Maryville. The Tritons defeated Walsh 78-74 and Tiffin 96-80. Junior Ronnie Carson averaged 16.5 points, 3.5 rebounds and 6.0 assists, while senior Eric Dust added 13.5 points and 8.0 rebounds per game. UMSL (2-0) plays host to Webster tonight in the start of a 12-game homestand, before welcoming Missouri Southern on Thursday. The Tritons lost both of their games in Michigan to open the season, falling to Davenport 69-58 and No. 13 Grand Valley State 87-44. Senior Kaitlynn Henning averaged 13.5 points and 3.0 steals, including a career-high 20 points against Davenport. UMSL (0-2) plays at future Great Lakes Valley Conference member Lindenwood on Wednesday before welcoming Purdue Northwest on Saturday for the Tritons’ home opener.